Praise God for His wondrous work in Digos City. The “Decision 2008” Crusade, sponsored by the brethren of Parkwood SDA church in before they were going to be baptizeModesto, California and led by: Pastor and Mrs. Rudy Bautista, assistant church pastor of Parkwood, Pastor Dr. Ron Rasmussen, senior church pastor, and Dr. Joe Fluence, head elder, started last March 18 – 29, 2008. 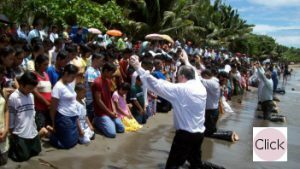 The baptism was on Sabbath Day and we praise the Lord, for there were 350 precious souls who accepted Jesus to be their personal Savior. We are praying that these new brethren will remain faithful until Jesus’ coming. There were two speakers during the crusade. They were Dr. Ron Rasmussen at Digos SDA Covered Court, and Dr. Joe Fluence at Digos City stadium. 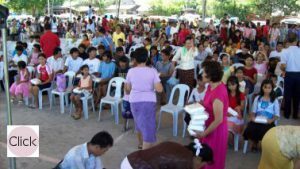 The adopted ministers, employed ministers and brethren of Davao Mission helped with the ground work for this crusade and God blessed their effort. To God be the Glory!